By definition filtration means removing one substance or material from another generally by a mechanical or physical operation. The process of air filtration involves separation of solids from gases by interposing a barrier through which only the clean gas can pass. This barrier is known as a filter medium. A filter medium must satisfy the requirements of efficient flow rate, satisfactory mechanical and chemical resistance and quality of filtrate or cake. Dust particles pollute the air and therefore adequate filtration is necessary prior to their discharge. Environmental regulations have become more demanding and it is our moral responsibility to save and protect our environment. It is obligatory on the part of industry to ensure that air being emitted is clean, without dust or harmful chemicals. ‘Baghouse’ is a generic name for Air Pollution Control Equipment. 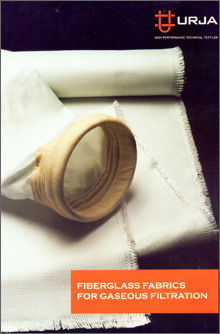 Fabric filters commonly known as bag-houses comprise an array of long narrow bags that are suspended in large enclosures. Several bags typically in the diameter of 120mm to 400mm and length of 2mtr to 10mtr are arranged vertically in this enclosure. These bags are used to filter dust particles from dusty gasses. Dust laden gas enters the baghouse and pass through the fabric bags that act as filters. The gas passes upwards/downwards through the bag and leaves behind a cake of dust outside/inside the bag. Common types of Bag-houses are Mechanical Shaker, Reverse Air, Pulse Jet and the new Hybrid bag-houses. Filter Bags are woven or non-woven in nature. 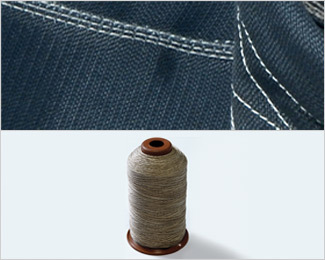 Urja is in the field of manufacturing only woven fabrics from Fiberglass. The count of yarn and weave pattern can be altered to determine the pore size for filtration. Fiberglass is strong, durable, chemically resistant and non-hygroscopic in nature. Long tubular bags stitched from Fiberglass Fabrics are used for hot flue gas filtration. Special finishes or coatings are imparted on theses fabrics to ensure adequate filtration. A commonly used mixture of graphite, silicone and PTFE has been used since many years. Urja offers specific fabrics for demanding applications and chemical attacks. Stitching of filter bag is of prime importance. A strong and appropriate thread will never cause the bag to break or tear during its operation. A broken bag will result in improper filtration and cause an unexpected shut down. A small factor could lead to huge problems for the plant manager. Urja manufactures the correct thread for fiberglass filter bags. Several strands of E-glass yarns are plied and twisted for extra strength and thereafter coated with PTFE under controlled conditions. The coating of PTFE will protect the thread from chemical damages when the bag is subjected to flue gases and also facilitate sewing operations. Urja’s product code PTZ 7513 has been performing and exceeding expectations in the Indian market since last 30 years.